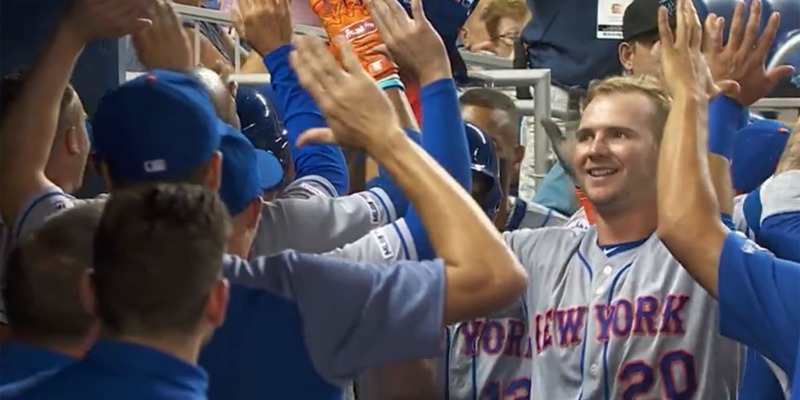 MIAMI – Pete Alonso hit his first career homer during the decisive four round ninth inning that Mets beat Marlins, 7-3, Monday night at Marlins Park. MIAMI – Pete Alonso hit his first career home during the crucial four round ninth inning when Mets beat Marlins, 7-3, Monday night at Marlins Park. Alonso, ranked by MLB Pipeline as Mets & # 39; top language (# 50 overall), jumped at a first position, 95.5 mph fastball from Drew Steckenrider and sent it over the midfield wall. According to Statcast, the three-round homer had a projected distance of 444 feet, with a starting angle of 21 degrees and a 112.8 mph output speed – the seventh highest of a Met since Statcast began tracking in 2015. Alonso is through the season's first four games 7-for-17 (.412) with three doubles, a homer and six RBI's. Before the homer he had been dull in four baths during the night. The four-run rally started when pinch-hitter Dominic Smith, Alonso's first-base backup, hit the switch with a single. Juan Lagares, who tried to pile him over, hit a pitch at the pitch when home-plate umpire Sam Holbrook said he had not offered. A replay review maintained the call. After Brandon Nimmo struck out, Amed Rosario produced the forward-looking RBI single to set the stage for Alonso's landmark. Christina De Nicola is a reporter and game producer for MLB.com based in Miami. Follow her on Twitter @ CDeNicola13 .